The key to power is in the heads. Cylinder heads are the key to making Horsepower. The cylinder head determines how much air can flow in and out of any motor. Engines are really just air pumps. The fuel rides along with the air in and out of the motor. The amount of air that you can move, determines how much power you will make. FE Specialties incorporates the latest technology in head porting techniques to insure that we are getting the most out of each engine. 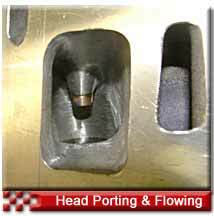 Head porting is also designed to each application, so we don't port a street motor the same as a full out drag motor. We back up our head porting with flow numbers from a Super Flow 600 flow bench. The key to power is in the heads.